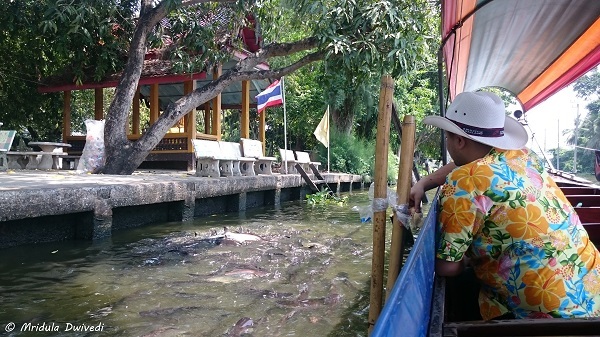 Doing a Bangkok Canal Tour is popular with tourists. 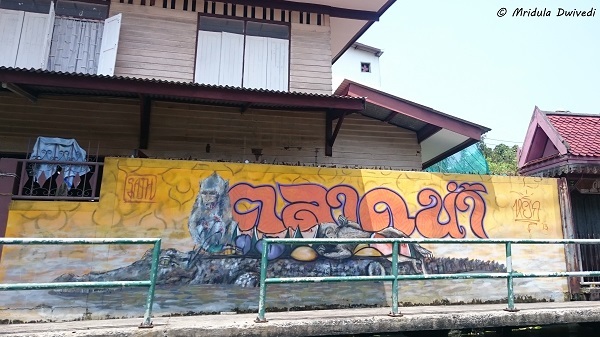 A canal is called ‘khlong’ in the local language. I went on a tour called Khlong Bang Luang. My guide for the day told us there are many routes on the canals. She added that doing a canal tour is mostly a tourist things. Locals seldom use the canals as they have access to roads. Long tailed boats are very popular across Thailand. they are used for navigating in shallow waters. 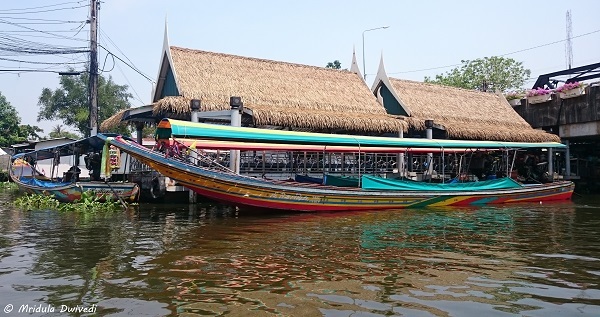 They are the vessel of choice on the Bangkok canal tours. In the local language the boats are known as reua hang yao. They are fitted with a second hand car or truck diesel engine mounted on the rear long tail and hence the name. The tail is used to navigate the boat! In earlier times the canals were used for navigation by the locals. Now most of the areas are connected by the road so it is rare to see such sights. I saw a long tail boat stopping at this canal shop to buy something. There are some shops and restaurants on the canals. As we were taking this tour during songkran I only had my waterproof cell phone with me. All the pictures in this post are clicked with it. I did not see too much graffiti. Whatever was there was colorful. When I would ask my guide with all excitement about the monument we were passing by, her usual reply would be, “oh it is a local temple.” The Bangkok canal tour offers many such moments. 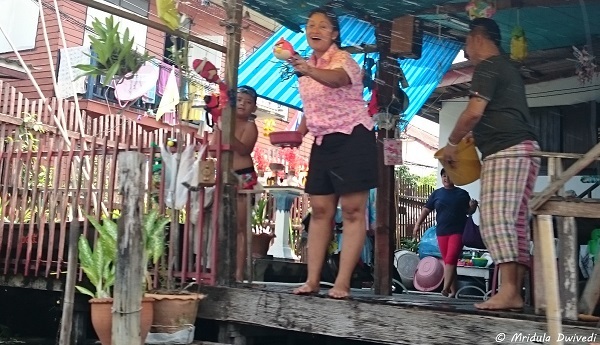 As I was in Thailand at the Thai New Year, I enjoyed songkran, the water festival. As we went on the Bangkok canal tour in the morning the tone was muted. Still, we did get some water thrown at us! This group also splashed some water on us. They were clearly enjoying their day by getting drenched, an excellent way to keep cool on a hot day! Nothing was bared, the stall was just selling bread. The bread is used to feed the catfish in the river. Feeding the fish is considered to be auspicious in Buddhism. Here was one of my group members feeding the fish. You can see that we were in our Songkran attire. 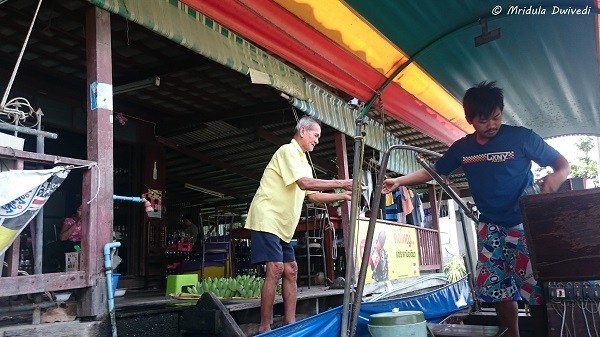 I visited Taling Chan Floating Market on my first trip to Thailand in 2013. 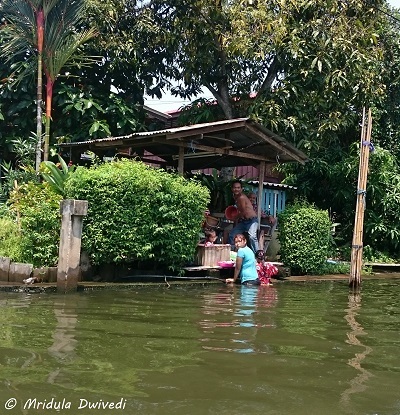 On my fifth trip in 2015 I passed by it again on the Bangkok canal tour through Khlong Bang Luang. My tour guide said taking a canal tour was a touristy thing now. I was still quite happy to sit in the long tailed boat and let Bangkok go by me.